I have been admiring J Crew heart sweaters for some time now. Unfortunately merino wool and I aren't friends, meaning no J Crew heart sweater for me. So, as you can imagine, I was thrilled yesterday when I discovered that Old Navy has come out with their own version in cotton here. Although it is not the beautiful turquoise color (above), gray and pink will do! I do love everything with hearts. The heart sweater is SO cute! It's been way too hot here for me to think about sweaters yet though! I LOVE that J Crew sweater! I got it from J Crew last year in tan and black and I don't think wool is a great combo for me either because it's super boxy... but it had hearts.... sooooo, it's in my closet. Can't wait to try the Old Navy one! Thanks so much for sharing! :) Hope you have a fantastic weekend! LOVE keeping up with your blog! I am jealous of your tan and black sweater-that was one I love! Thanks for stopping by Amanda! That sweater is so cute! Love the bag too!!! 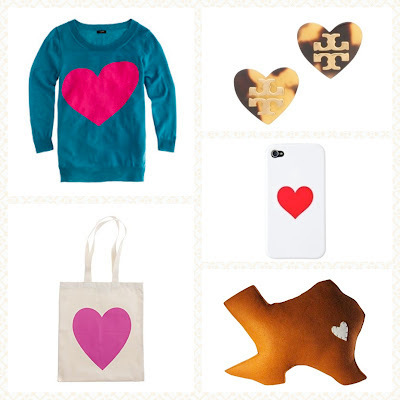 Since I screen print, that bag inspires me to try out a heart design! I would love it in kelly green!